Minnesota Vikings wide receiver Adam Thielen catches a 3-yard touchdown pass during the second quarter. The Philadelphia Eagles will head back home to the friendly (or perhaps unfriendly) confines of Lincoln Financial Field, where the Birds currently have a 13-game winning streak going, that is if you don't count the meaningless Week 17 game last season when the Eagles' JV team lost to the Cowboys' varsity team. 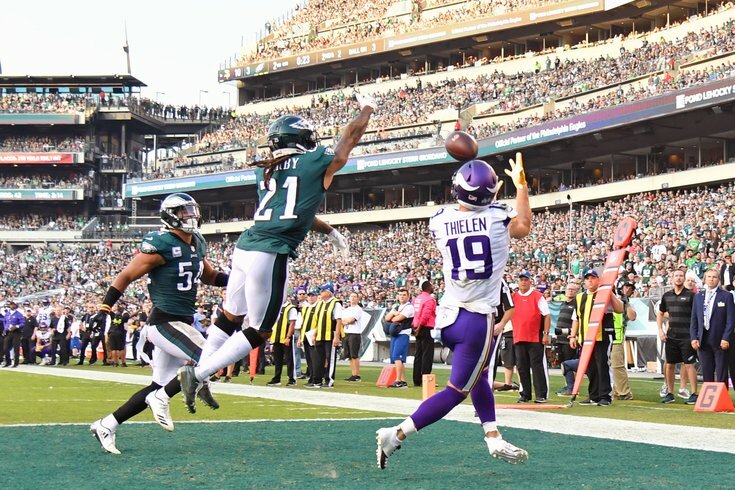 One of those wins during the streak, of course, was the Eagles' 38-7 rout over the Vikings in the NFC Championship Game, when Nick Foles suddenly caught fire and would eventually finish the job in the Super Bowl... in Minnesota. The Eagles come into this matchup with a whole slew of players on IR, in addition to their newest (likely) short-term loss in DE Derek Barnett. The Vikings, meanwhile, have their share of missing players as well, mostly notably stud pass rusher Everson Griffen. Here's the final Friday Eagles-Vikings injury report heading into Week 5. As we noted in our five matchups to watch, the Vikes have a pair of receivers who have filled up the stat sheet so far this season in Adam Thielen and Stefon Diggs. The embattled Eagles secondary will have to find a way to keep them under control. They did so last year with a pass rush that overwhelmed an unimpressive Vikings offensive line. The betting lines opened for this game at Eagles -3, and have stayed there throughout the week. Here are our staff writer picks, as well as who other publications are picking. For the gambling degenerates here are my Week 5 NFL picks. Feel free to comment on the action of the day below.